It's Christmas time again and so that means it was also the time to put up the Cher doll Christmas tree last week and take blurry pictures of it with my iPhone. This first picture shows my favorite Cher outfit and doll outfit (Foxy Lady) from the Cher show. And since full episodes of that show have not been re-aired in totally, I'm really enjoying reading about them episode by episode in thew new Josiah Howard book. The Mother Goose outfit from The Sonny & Cher Comedy Hour was this year's addition to the tree. Love it! I located a Santa hat for the Sonny angel, procured from the head of a little stuffed bear. When I removed the hat from the bear, there was a smaller Santa hat underneath glued to the bear's head. This was a superfluous hat! Was also able to fulfill a life-long dream...which was to live in a house with a fireplace mantle so I could put my Mego Cher makeup head on it for Christmas. I ordered a child's size Santa hat which ended up being too big (but which is working in a sultry kind of way). Because the Mego makeup head is bare-shouldered, she looked a bit too naked for my Aunts who will be visiting next weekend. So I added the jester neck piece (which I bought for my dog Franz two years ago). Merry Christmas to all the festive Cher Zombies around the world! So while we're cooling our heels waiting for the new Cher single to be released this month, I came across some good video of Cher on the UTubes. - Cher calls CNN to talk about Hurricaine Katrina, feeling the same helplessness we all did but with some extra money to help out (2005). - Cher calls CNN to talk about the death of Michael Jackson (summer 2009) and her experiences working with him; how hard it was to learn the Jackson Five dance for her Cher TV show, how Michael loved her beaded socks. - Cher continues to talk that night about Farah Fawcett (summer 2009). "This chick was holding on to thin air and still had a great attitude." - Cher peforms (circa 1966) "Mama" with all those creepy dolls at what looks like a staged doll factory. Far from being creeped out, Cher looks pretty blaze about it all. 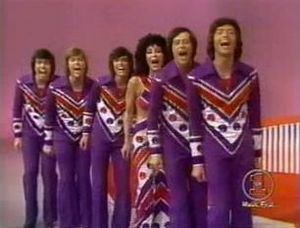 Although Cher did video for her 1978-9 Take Me Home shows, the big opening video I remember is from Heart of Stone tour. It's fuzzy but you get a sense in the jump in polish from concert videos made from 1989 to 2008. This opening is just a collage of clips as opposed to a remix of music and clips. The first video opening at Caesars Colosseum. What's great about these openings (whatever version they take) is not just how well they familiarize nonfans with Cher's 4-decade oeuvre, but how much excitement they build up before Cher makes her entrances.I love how the second one is a lovely mashup of "Believe," "I Got You Babe," "Dark Lady," Gypsies Tramps and Thieves," "Song for the Lonely" and "The Beat Goes On." - Wetten Dass (German) interview from 1995, part 1 and part 2 and part 3 (she sings a O Holy Night in German!!). - Wetten Dass from 1999. - Sanremo (Italian) interview with audience from 1999. It's been a very crazy month and I've been lagging with my blogging. But Cher Scholar is exhausted. We got back from Cancun early in the month and then went right into Thanksgiving prep. My mother-in-law Donna came for the long weekend (and I love it that she was so enthusiastic about seeing Burlesque Thanksgiving-eve with me and John. See our collective review for more about that.) Unfortunately, in between launching the big dinner with new recipes and juggling a huge work ramp-up to a Cartagena Colombia meeting, I've been wiped out, in pain and feeling a bit deflated from all the work. One pre-Thanksgiving task I looked forward to was putting up Christmas decorations, which (like cooking Thanksgiving dinner instead of grabbing take-out at Dinahs) I hadn't done for two years. And this means hoisting up the Cher Christmas tree! However, I was initially thwarted in this most pleasant task because two mice had been living in our garage. John freaked out and spent $50 on every kind of imaginable mouse trap to place on every conceivable mouse path in our garage, leaving the leftover un-opened traps sitting right on my boxes of Cher crap. Sure I could have moved them out of the way. As if that were that easy! I was afraid of them! What if one accidentally fired off or had a dead mouse decaying in its clutches. I couldn't even look at them. Before our trip to Cancun I had asked John to move the traps and he, thinking I was being a big baby (guilty as charged), was in no hurry to do it. I kept expressing how important it was for me to get to my Cher junk so I could assemble the glorious Cher tree. On a layover from our fight back from Cancun I started again to worry about the traps and having to lose a finger trying to get to my Cher dolls. This was around the time I was overspending on Burlesque memorabilia and it sort of seemed like he had set Cher traps as an intervention! So I confronted him right there in the airport (after finishing the Vanity Fair magazine article)...why you gotta be puttin out Cher traps on me? He mocked some outrage and said it was all untrue and ridiculous that I would accuse him of such a thing. Then he said it was a moot point because he already picked up the Cher traps! Ah HA! He admitted it! They were Cher traps!! 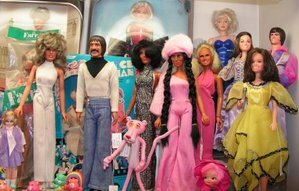 There are now 10 Cher dolls and some new outfits, including my favorite Foxy Lady outfit. I acquired the white tux outfit for the Sonny topper. I think this makes him look both elegant and angelic. 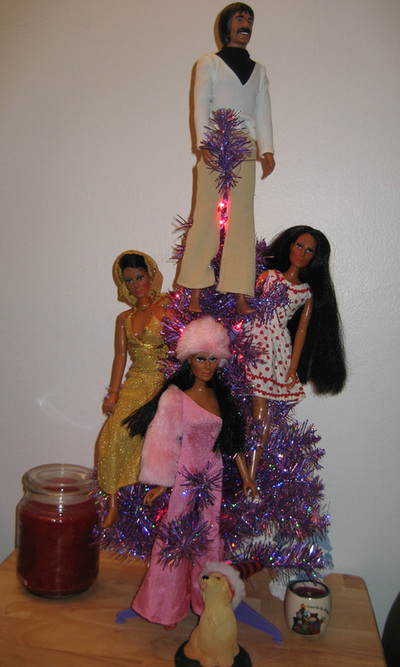 I decided to assemble all of Cher's boyfriends and lovers as the nativity scene at the bottom of the tree. This proved challenging because only Gene Simmons and Richie Sambora have dolls (or "action figures" as they like to be called). Val Kilmer as Batman didn't count because you couldn't tell it was him and besides, the doll was too expensive. My friend Coolia suggested I make paper dolls. At first I didn't want to do this because I hated paper dolls as a child. Really found them excruciatingly boring. But the Cher tree project changed my mind. I found a tatted-up Paul Bunion paper doll for Gregg, a nerdy paper doll for David Geffen and a somewhat dapper doll for Val. Note: I am still working on the Robert Camiletti doll. I haven't found the right body yet. Click to enlarge any of the pics. For quite some time there has been a ton of links clogging up my blog to-do list. I’m just gonna throw them all up here now just so I can move on with my life. You can link wherever strikes your fancy. My take for must see items have a star (or two) next to them. A Cher Investment: songs written by Bon Jovi, Cher, Celine Dion and Justin Timberlake now form part of the investment portfolio of Dutch civil service pension fund ABP. Dinner Date Night Idea: stay at home, watch Moonstruck and bake a pizza; here's how. Good News: the paparazzi are starting to get arrested in LA when their volume and tactics put people in jeopardy. Uh...it's about time. Read about such an arrest. And if you recall my gripes last week or so about Cher's modern dance routines compared to her 80s Vegas ones, here is a story on her choreographer Doriana Sanchez and how they hooked up. And Cher may not support Obama but he supports Cher: in a joke last week Jay Leno said: "In an interview in People Magazine, Barack Obama said he was more a fan of Sonny and Cher than he was a fan of Donny and Marie. Well, that should answer the question of whether he's black enough!" That's actually very kewl. 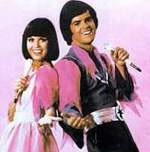 Sonny & Cher got soul...we knew it! It's small but hey...it's my first year.